If you’ve been to Chicago’s Field Museum of Natural History in the last 30 years, you’ve probably seen Peggy Macnamara. As the museum’s one and only Artist-in-Residence, Macnamara is as much an institutional treasure as “Sue,” the world’s most complete T. rex skeleton (but much friendlier and more talented). Almost every day, she can be found in front of one of the display cases—watercolor sketchbook in her lap, pencil or paintbrush in her hand, drawing and painting one of the many specimens in the museum collection. If you’re inclined to watch her work, you’ll see her gradually fill a blank page with a flurry of skeletal lines and fragmentary forms—an artist’s version of fossil reconstruction. Then she slowly shapes her subject, magically unraveling a tangle of markings with fine details, vibrant colors, and a wash of motion. A motionless elephant is suddenly stampeding off the page; static starlings transform into a swirling murmuration of flight; an inanimate alligator stalks the banks of a riverbed; and a simple mallard’s nest comes alive with the anticipation of newborn ducklings. I spoke with Macnamara in her artist’s studio, located next door to the museum’s Bird Specimen Collection. It’s a cozy, creative sanctuary piled high with pages of her drawings and watched over by a taxidermied falcon on her desk. How did you first get involved with the Field Museum? I wanted to get better at figure drawing when I was younger, and the Field Museum had the Malvina Hoffman exhibit. She was a sculptor who studied with Rodin. I would park, drop in, and draw, and I figured I could do this until I nailed the figure drawing and then I’d move on from there. After the Hoffman exhibit, I moved to China or rather the museum’s Hall of China. First I just moved around the museum and drew everything. Eventually I got into birds—they pulled a display case out into the hall and I had geometry with organic materials. It was heavenly. And then about 15 years into my visits, Steve Goodman [the museum’s conservation biologist and field biologist in the Department of Zoology] invited me to Madagascar to illustrate a book for him. I was way into conservation, but it’s so hard to contribute if you’re not a scientist. You can do citizen science, you can get your PhD, but even then you get pigeonholed into a specialization. So that was the door opening for me into the world of conservation. You seem to be especially drawn to (no pun intended) insects and birds. 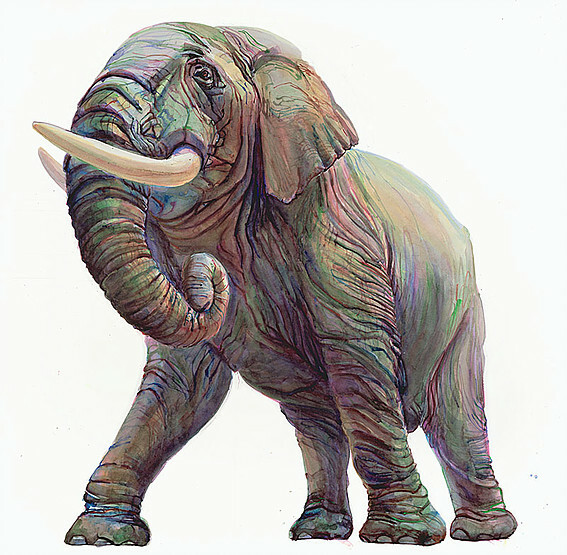 What attracted you to those creatures? I got really into insects because the University of Chicago Press invited me to illustrate a book about insects. 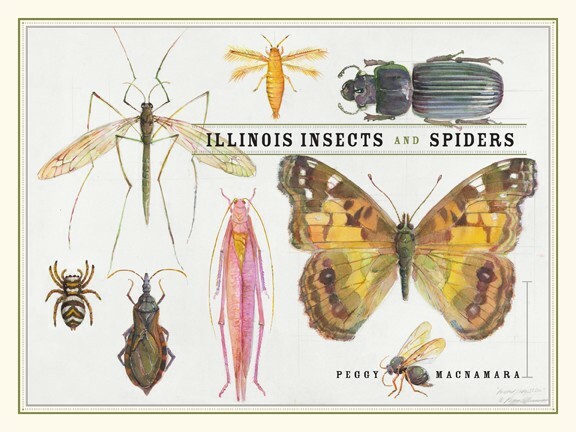 I wanted to draw more exotic insects, but they wanted something on the insects of Illinois. I thought, what is that? Flies? I didn’t know anything, but I learned there are so many interesting insects right here in the Midwest—like Illinois moths! Wow, right? While that book was in progress, I opened up a cabinet at the museum and there was somebody’s life’s work. It was Robert Gregg’s extensive collection of insect nests, tucked away, each specimen wrapped, labeled, and placed in an old box. That’s the PhD route. Gregg was a professor of biology at the University of Colorado and he collected nests from all over the world, and they were all in boxes in this cabinet. That’s where a lot of research ends up. 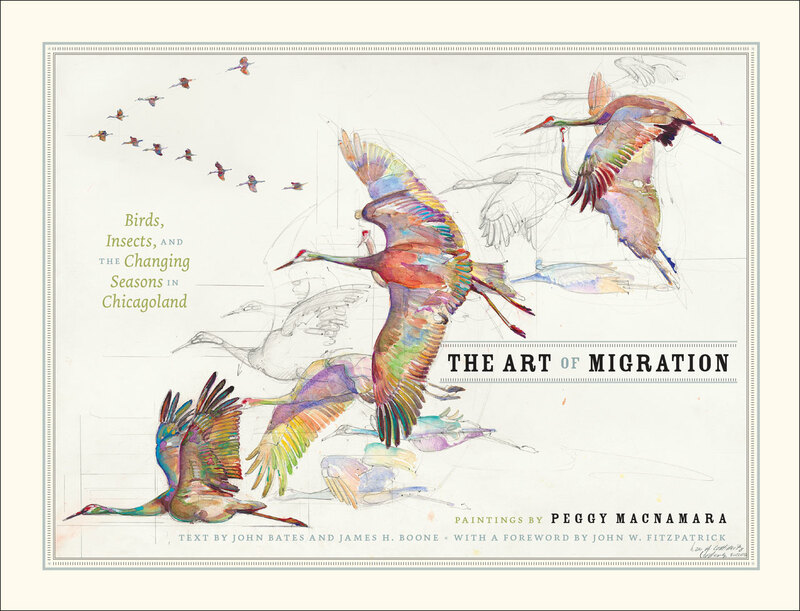 Then I drew a book about bird migrations. A hummingbird showed up outside the Shedd Aquarium, and everyone was excited. One of the ornithologists told me how the bird flies 600 miles from the upper Midwest to Costa Rica, crossing the Gulf of Mexico without stopping. I thought that was amazing. So I decided to illustrate the migrations that take place every year along the lakefront and through our backyards. That’s how these things happen. How do you work with the scientists at the museum? Basically, I run the images by a scientist to check for accuracy. And then I get more knowledgeable about the subject. I’m not an old-fashioned scientific illustrator, where you work for a scientist and everything is in black and white. I come from another world, the art world. [Macnamara is also an Adjunct Associate Professor at the School of the Art Institute of Chicago where she teaches “Scientific Illustration.”] I talk about nature differently than a scientist talks about it. It took a long while to win over the scientists—I’m still working on that. Everything I draw is accurate—there’s always the right amount of feathers on a particular bird—but they still think I’m a little wild. Can you talk about your process a bit? How many drafts do you work with before you have a finished piece? My process is slow because I have the luxury of time. I’m not illustrating for a scientist; I’m doing this to make a good piece. So I create a first draft and it’s wrong. You can’t fall in love with any part of it; you have to think of the whole. So I create another draft and another and no one line is more important than the whole. You have to stay out of your way and let the work evolve. About halfway through, it takes on its own life and it starts to go in a direction you hadn’t anticipated. Then you just dance with it until the end. It might look like I have a plan and that I know where I’m going in advance, but I don’t. I just put down information and try to make it all relate. I bet you’ve had some interesting interactions while drawing in the museum? Oh, definitely. One time I had water on my sketchbook, and a little boy reached over and smeared it across the page. Everyone around me gasped, Oh my god! I said, Don’t worry; it’s not a problem. Everyone was so invested because it was a live performance that was happening in front of them. Probably my favorite question I’ve ever been asked while drawing is, Did you kill that? How do you use your art to connect people to nature? I try to tell a story about nature with my work and to engage as many people as possible in what’s going on in science. I think the colors and the freedom in my paintings make science and nature more approachable. 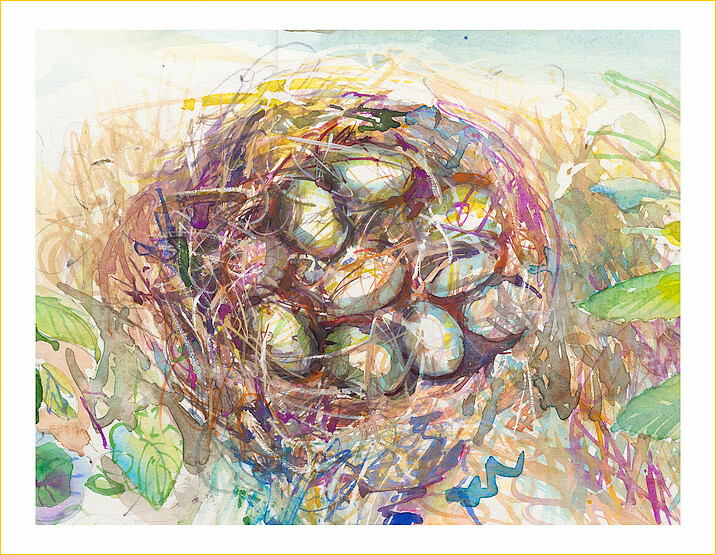 I remember when I was painting one of the insect nests, a scientist asked me why I was making it so big. I said so a kid can look at a caddisfly nest and see how it builds little houses out of recycled material. I see a nest as a piece of architecture and these little creatures as incredible recylcers. I think the entomologists do too, but they’re in their one world—it’s rove beetles for 45 years. Macnamara continues to open up new worlds, exploring the stories embedded in science. You can read more about her work in her essay contribution to City Creatures: Animal Encounters in the Chicago Wilderness. Jeremy Ohmes is a writer, musician, runner, gardener, and the Communications Manager for the Center for Humans and Nature. He graduated from University of Oregon and Loyola University Chicago. Find more of his work at jeremyohmes.wordpress.com.